When spending time on the Colorado River, we are given countless opportunities for botanical sight-seeing and to develope a greater appreciation for the natural world. The biodiversity of plant life found along riparian areas stand out in sharp contrast – a backdrop of red rock highlights floral endowments aplenty. The wind fluttering through the leaves of cottonwood trees. The trembling of needle-and-thread grass near the water's edge. Globe mallows and narrowleaf four-o'clock bloom brightly hued to complement the setting sun's palette. Upon closer inspection, however, the plant communities of riverine environment are changing at a dramatic rate. The plants which alter the integrity of the native ecosystem are interesting and beautiful, but have devastating consequences. The time has come for an increased awareness and true activism in preventing the spread of invasive plants. Consider Elaeagnus angustifolia, a silvery tree with rusty bark and beautiful yellow flowers. The sweet-sour smell of the tree in bloom is as attractive as the specimens themselves. 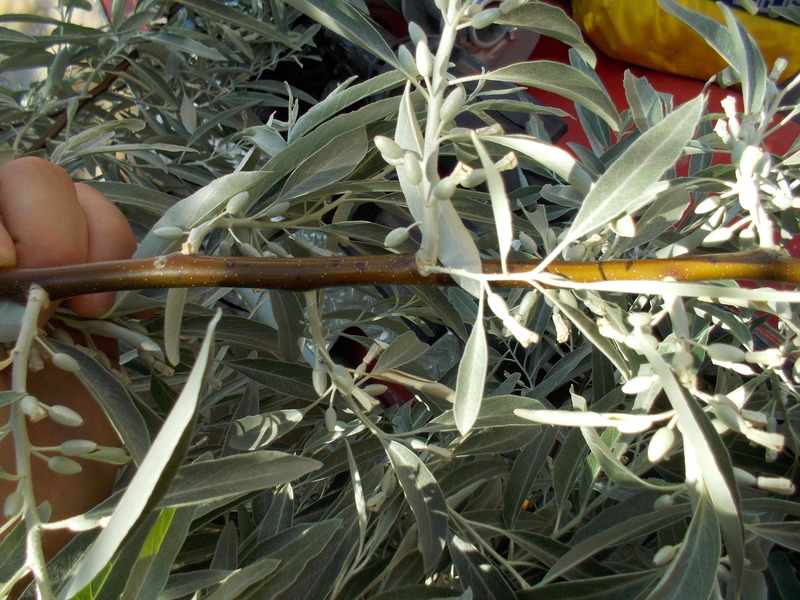 otherwise known as Russian olive, this tree species was planted to increase shade and establish effective windbreaks. All too successful, the tree has surely out-competed native plants for light – even girdling them on their way to the top. The invasive canopy spreads thickly to conquer wet areas, even in sites long established with native vegetation. Longlived seeds of Russian olives can yield new growth up to three years after dispersal, and are often conveniently transported by animals. The plant, mostly inedible, is not preferred by grazing wildlife or livestock. These trees even alter the chemistry of the soil to improve their success. With long, deep tap roots, Russian olive's drink more than their fair share from the water table. If all of these adaptations do not appear threatening, consider their long thorns which have been known to injure wildlife, rangeland mammals, and humans alike. According to Kathleen Cain (The Cottonwood Tree, 2007), "[Russian olives] could replace the cottonwoods before the end of the twenty-first century." Unless we become more proactive in addressing this issue, sightseers of the Colorado Plateau can expect to see the river's edges replaced with thick stands of Russian olives in the very near future – similar to the riparan zones along the San Juan. The easy-to-access sand bars and lunch spots will be no longer available to rafters. Gone will be the once plentiful corridors for thirsty wildlife. With these changes will come the total loss of integrity of the Colorado River. We must continue to observe and promote the values of naturally native plant communities. We must work to remove invasive species including Russian olive (mechanical and chemical treatments including the "frill cut method" which kills the top poriton of the tree while still providing habitat for wildlife), and replace those invasives with hardy native vegetation. We must monitor and reassess treatments areas – this is not a "set it and forget it" endeavor. 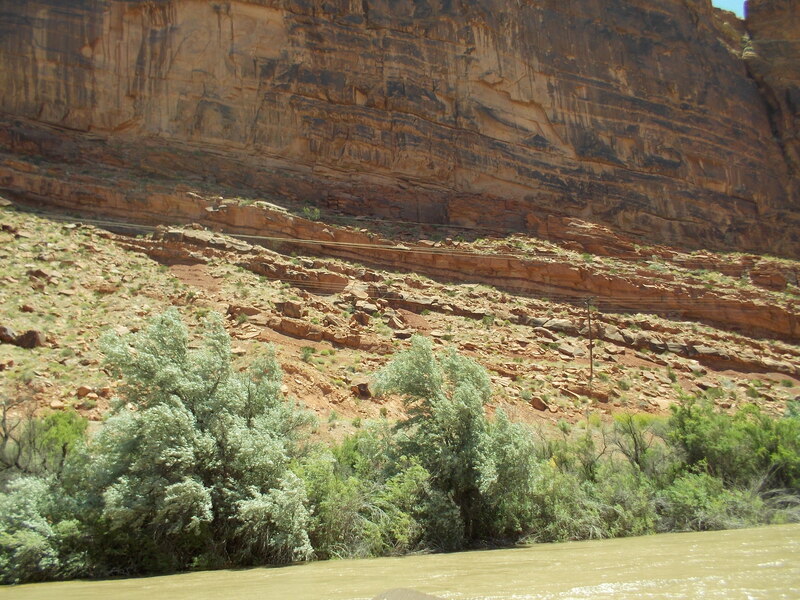 Restoring the Colorado River to its true quality requires commitment, time, and funds. At Plateau Restoration, Inc., we rely on dedicated partners to help in the fight against the spread of Russian olives. In order to promote healthy riparian environments, we work hard to monitor and restore threatened habitats using a variety of treatment methods. But we cannot do this without your help – be aware of the horticultural changes taking place throughout our region, take part in local community efforts and restoration projects, speak out to encourage legislation which provides cost-effective solutions to the spread of invasive species, and generously donate to this cause. With your help, the true beauty of the Colorado River will be observable for many generations to come.